Heat oven to 350 degrees F. Grease bottom and sides of square 9×9 inch pan with shortening. Mix sugar, 1/2 cup shortening, vanilla and eggs in medium bowl with wooden spoon. Stir in flour, cocoa, baking powder and salt. Spread batter in pan and bake 20-25 minutes until toothpick inserted in center come out clean. Heat camamels and milk in saucepan over low heat, stirring frequently until caramels melt. 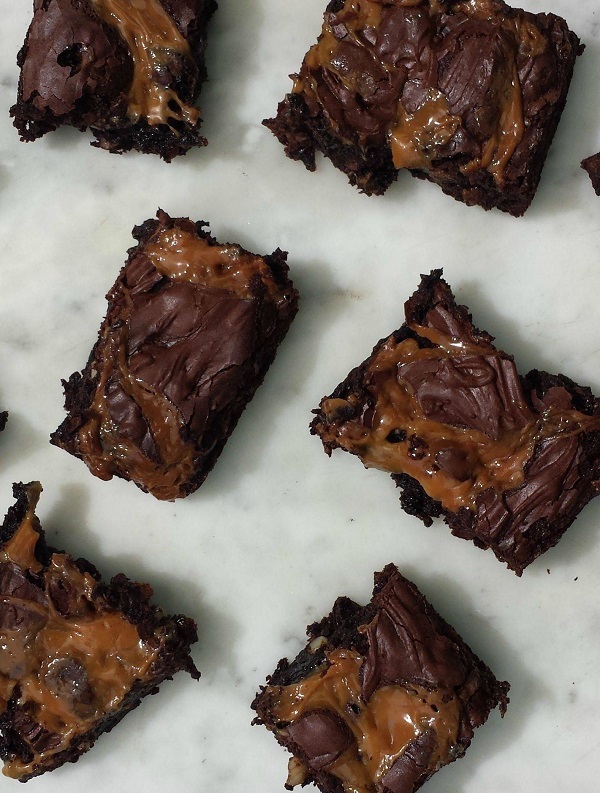 Drizzle over warm brownies and sprinkle with pecans. Place chocolate chips and 1 tsp shortening in small microwavable bowl. Microwave uncovered on 1/2 power 1-2 minutes, stirring halfway through until chocolate is meleted. Drizzle chocolate over pecans. Leave to cool completely (about 1 hour). Cut brownies into 4×4 rows.